“Rants based on discontents are the first stage of any movement,” said Michael Kazin, a professor of history at Georgetown University. But he said it was unclear if the current protests would lead to a lasting movement, which would require the newly unleashed passions to be channeled into institutions and shaped into political goals. Publicity surrounding the recent arrests of hundreds in New York, near Wall Street and on the Brooklyn Bridge, has only energized the campaign. This week, new rallies and in some cases urban encampments are planned for cities as disparate as Memphis, Tenn.; Hilo, Hawaii; Minneapolis; Baltimore; and McAllen, Tex., according to Occupy Together, an unofficial hub for the protests that lists dozens of coming demonstrations, including some in Europe and Japan. In the nation’s capital, an Occupy D.C. movement began on Saturday, with plans to join forces on Thursday with a similar anticorporate and antiwar group, October 2011, for an encampment in a park near the White House. “I believe that I am not represented by the big interest groups and the big money corporations, which have increasing control of our money and our politics,” she said, adding that she was not against capitalism per se. 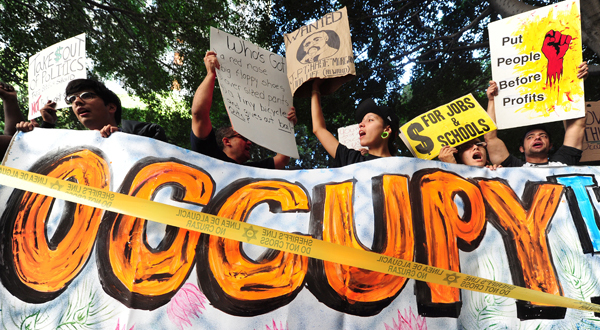 Javier Rodriguez, 24, a former student at Pasadena City College, held a sign that read “Down with the World Bank” in Spanish, and said he was anti-capitalist. Each evening, the number of protesters swells as people come from school or work, and the group marches to Michigan Avenue. Sean Richards, 21, a junior studying environmental health at Illinois State University in Normal, said he dropped out of college on Friday and took a train to Chicago to demonstrate against oil companies. But if the movement is to have lasting impact, it will have to develop leaders and clear demands, said Nina Eliasoph, a professor of sociology at the University of Southern California. With the country in such deep economic distress, almost everyone is forced to think about economics and politics, giving the new protests a “major emotional resonance,” she said. Ashley Southall contributed reporting from Washington, Ian Lovett from Los Angeles and Steven Yaccino from Chicago. Copyright 2011 The New York Times Company. Reprinted from The New York Times, National, of Tuesday, October 4, 2011.